Why did you take a selfie from the wedding stage? To the best of our knowledge in those years 2014-2016, we probably had spoken to each other 3-4 times where the calls didn’t last more than 3 minutes. And we also never got to meet each other as we could find no opportunity for the same. That was how the Lord preserved that special moment for us. Then when my fiancee returned from her London trip, I planned to drop by on my way to work as I traveled to Chennai, back after a week long stay at Bangalore. We thought this was our chance to have a picture taken together and I was dressed for the occasion 😉 I had informed her uncle about my plan to visit them that morning. While I was nearing their home, I got a call from her uncle stating some irrelevant excuse and to drop my plan of visiting my fiancee that day and even until the wedding day..! Her aunt called and told me that my fiancee was broken by uncle’s rude behaviour and disrupting our plan to meet. Yet, since we believed in our Blessed Controller who causes ALL things for our very best, we abided by the instructions laid by her uncle and never made any attempt to meet until our wedding. It was time I began building this wedding website and wanted to place a picture of both of us together. My fiancee wanted to try out her Photoshop skills and attempted morphing few pics of ours. We were not satisfied with any combination, as they weren’t real. That was when we surrendered to the Lord and committed even this petty matter into His hands and were willing to wait for the fullness of time when we could have our ‘real picture’ together. It was the day before our wedding, when we had a brief discussion on the order of service with brother Zac Poonen. Brother Zac emphasized that, it would be good if a wedding ceremony be an informal occasion, where the Bride and Bridegroom felt at home, among family and friends. By the end of the discussion, he asked us if we wanted to do anything specific on our wedding day. 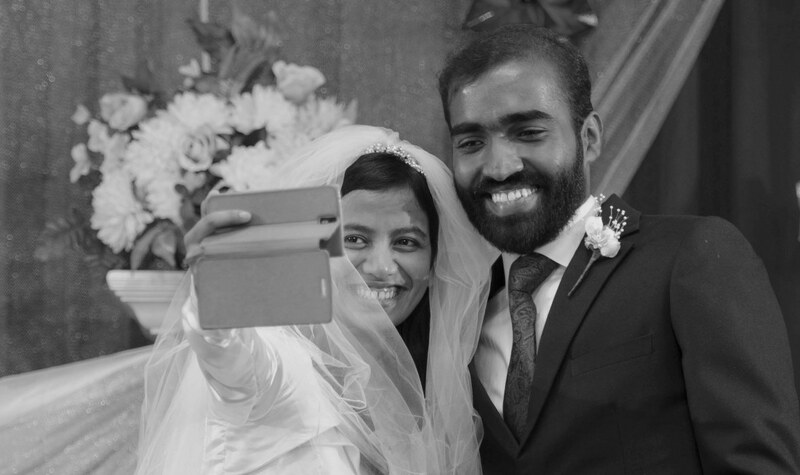 Immediately, we both looked at each other and with a twinkle in our eyes told him, that we’d like to have our first selfie taken together on the wedding stage before we got down. On our wedding day the 24th of November 2016, my fiancee slipped her mobile phone into my coat pocket through a girl who was helping her get ready. The entire wedding ceremony was coming to an end, also we weren’t sure if brother Zac remembered our request. Yet as soon as we were declared as man & wife and were about to leave the stage, brother Zac added “Come, do what you want to do…” and that was the fullness of Time (Ecc 3)..! Silas, How did you find out God’s will in marriage?